Should you get the Samsung Galaxy Tab S5e or the Galaxy Tab S4? In my comparison, we compare all features including specs, the S Pen and more. Samsung introduced the Samsung Galaxy Tab S5e about half a year after the introduction of the Galaxy Tab S4 (review). That’s a bit unusual and is the reason why we should take a very close look at both and compare them. Which is the best one and who are they aimed at? Let’s start with the design. From the front, both tablets look very similar with their 10.5-inch AMOLED screens and slim, black bezels. The home button that used to be underneath the screen for years has vanished. Instead, judged from the front, both look very similar to Apple’s 2019 iPad Pro lineup. However, this time, Samsung was first with this design. While the front of the Samsung Galaxy Tab S4 and Galaxy Tab S5e look very similar, that is not the case for the rest of the body. With the S4, we get a metal frame and a glass back. On the other hand, the S5e features a full metal body. Personally, I prefer a full metal body especially since the S4 does not even support wireless charging. If you look at the dimensions, the design has changed a lot. In fact, the Galaxy Tab S5e is much thinner with 5.5mm compared to 7.1mm. It brings 400g onto the scale which is 82g less than the predecessor brought. Both tablets have four speakers placed around the frame. They’ve got a USB C port and a microSD card slot each. While the Galaxy Tab S4 has a standard headphone jack, this very useful feature is missing from the newer one. I like that the Galaxy Tab S5e has a built-in fingerprint scanner which is located on the side. You can unlock the S4 with an iris scanner and facial recognition. However, it does not work as great as Apple’s Face ID does. 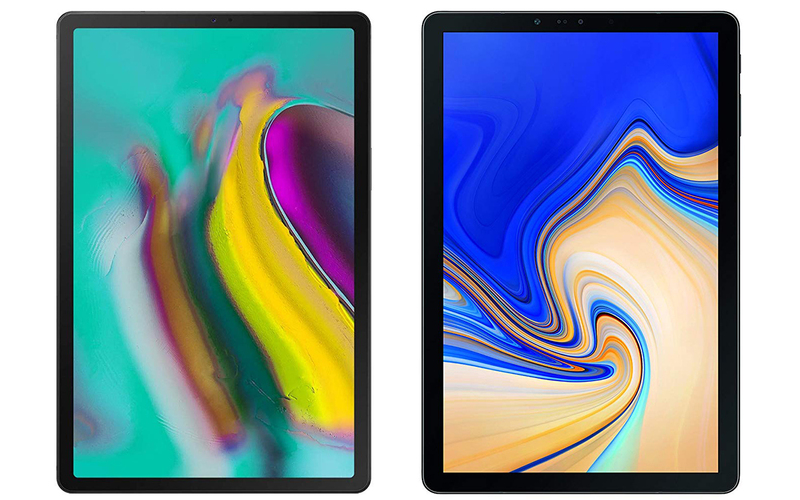 The screens of the Galaxy Tab S5e and Galaxy Tab S4 seem to be identical or at least very similar. Both got a diagonal of 10.5-inches and both are Super AMOLED panels with a resolution of 2560 x 1600 pixels. When looking at Android tablets alone, they clearly are the best screens on the market right now. With that being said, there is one major difference. The S4 is sipped with an active stylus called S Pen at no extra charge. As far as we know, the S5e does not support a pen at all. So, if you like to take handwritten notes with your tablet, you shouldn’t go for the new one. There are major differences when it comes to the internal hardware too. While the S4 is shipping with an older Qualcomm Snapdragon 835 high-end processor, the S5e has a Snapdragon 670 upper-middle-class chipset. Additionally, both have 4GB of RAM and at least 64GB of internal storage. If you look at the numbering of the Qualcomm SoCs, you would think the Snapdragon 835 would be much faster. Well, that is true. However, not by much. The Snapdragon 670 is a surprisingly powerful chip that is almost as fast as the 835. In fact, in real life, you probably won’t notice any differences. While the Samsung Galaxy Tab S4 is running Android 8.1 Oreo out of the box, the Galaxy Tab S5e is one of the first tablets running Android 9.0 Pie. However, since both tablets are released less than a year from each other, I wouldn’t worry about it that much. In the past, Samsung has been pretty good with updating their premium tablets. Obviously, I can’t promise anything because I don’t have any inside information. But, again, based on the last couple of years, both tablets should get at least two if not three major software updates. You will always have to wait a bit though. The Galaxy Tab S lineup has gotten many updates, but the Galaxy S smartphones always came first. Alright, that’s my comparison of the Samsung Galaxy Tab S5e vs. the Galaxy Tab S4. Which one is the better tablet? And which one should you buy? Well, because they are so similar, that is hard to say. And, since nobody reviewed the Galaxy Tab S5e yet, there can’t be a definitive answer yet. With that being said, based on the specifications alone, it is quite easy to answer. If you want or need an S Pen, you should go for the Samsung Galaxy Tab S4. However, if you don’t, I would choose the Samsung Galaxy Tab S5e because it is thinner, offers a fingerprint scanner, and more recent software. However, if you don’t feel strongly about those features, you could just compare prices and go for the cheaper one. Again, the Samsung Galaxy Tab S5e and Galaxy Tab S4 are very similar and will perform almost identical in real life. The Samsung Galaxy Tab S4 is the best Android tablet in 2018. In fact, it is the fastest one available, offers a great Super AMOLED screen and recent Android 8.1 Oreo software. Additionally, we are getting an S Pen, an iris scanner and a lot of software features. Build quality and battery life are very good too. However, I think it is too expensive with a starting price of 649 USD. Samsung Galaxy Tab S4 Review: How Good Is This Tablet Really? My concern is the potential for the s5e to bend with that aluminum back. Everyone keeps talking about how thin it is, well thin usually means less structural integrity. I need to see if it bends before I spend my hard earned money on a tablet.